Recent comparisons of benthic macroinvertebrate (BMI) sampling protocols have shown that samples collected from different habitat types generally produce consistent stream classifications and assessments. 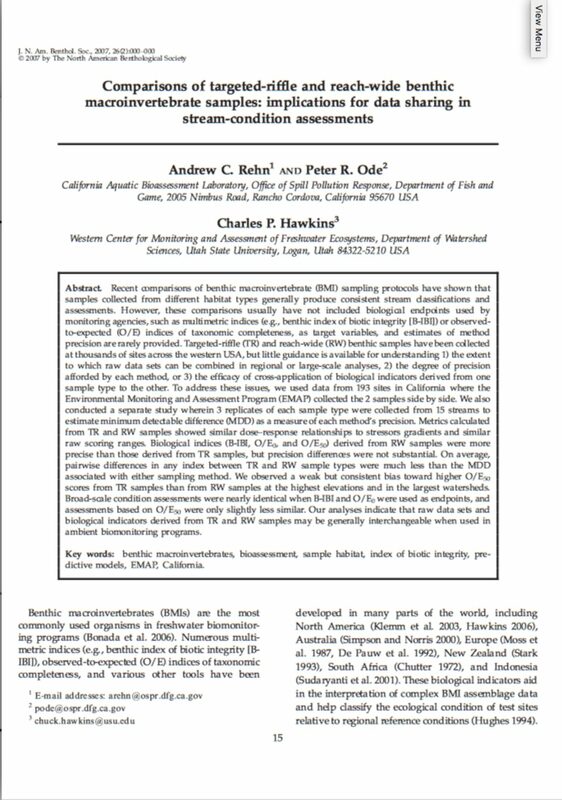 However, these comparisons usually have not included biological endpoints used by monitoring agencies, such as multimetric indices (e.g., benthic index of biotic integrity [B-IBI]) or observed- to-expected (O/E) indices of taxonomic completeness, as target variables, and estimates of method precision are rarely provided. Targeted-riffle (TR) and reach-wide (RW) benthic samples have been collected at thousands of sites across the western USA, but little guidance is available for understanding 1) the extent to which raw data sets can be combined in regional or large-scale analyses, 2) the degree of precision afforded by each method, or 3) the efficacy of cross-application of biological indicators derived from one sample type to the other. To address these issues, we used data from 193 sites in California where the Environmental Monitoring and Assessment Program (EMAP) collected the 2 samples side by side. We also conducted a separate study wherein 3 replicates of each sample type were collected from 15 streams to estimate minimum detectable difference (MDD) as a measure of each method’s precision. Metrics calculated from TR and RW samples showed similar dose–response relationships to stressors gradients and similar raw scoring ranges. Biological indices (B-IBI, O/E0, and O/E50) derived from RW samples were more precise than those derived from TR samples, but precision differences were not substantial. On average, pairwise differences in any index between TR and RW sample types were much less than the MDD associated with either sampling method. We observed a weak but consistent bias toward higher O/E50 scores from TR samples than from RW samples at the highest elevations and in the largest watersheds. Broad-scale condition assessments were nearly identical when B-IBI and O/E0 were used as endpoints, and assessments based on O/E50 were only slightly less similar. Our analyses indicate that raw data sets and biological indicators derived from TR and RW samples may be generally interchangeable when used in ambient biomonitoring programs. The delta smelt is endemic to the upper San Francisco Estuary. Much of its historic habitat is no longer available and remaining habitat is increasingly unable to sustain the population. 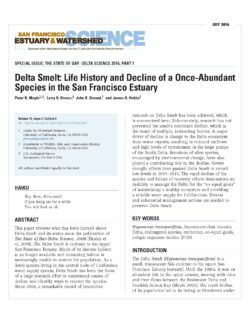 As a listed species living in the central node of California’s water supply system, delta smelt has been the focus of a large research effort to understand causes of decline and identify ways to recover the species. Since 2008, a remarkable record of innovative research on delta smelt has been achieved, which is summarized here. Unfortunately, research has not prevented the smelt’s continued decline, which is the result of multiple, interacting factors. A major driver of decline is change to the Delta ecosystem from water exports, resulting in reduced outflows and high levels of entrainment in the large pumps of the South Delta. Invasions of alien species, encouraged by environmental change, have also played a contributing role in the decline. 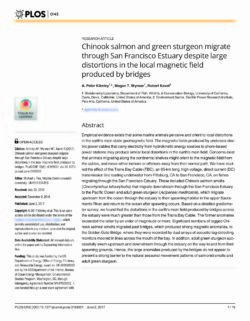 Severe drought effects have pushed delta smelt to record low levels in 2014–2015 and diverse and substantial management actions are needed to preserve delta smelt. Prior to Euro-American modification of the landscape, the Laguna de Santa Rosa (hereafter, “Laguna”) supported a diverse and extensive array of wetland and riparian habitat types ranging from tule marshes and willow forests to wet meadows and vernal pools. As one of the largest wetland complexes in northern California, the Laguna was a productive ecosystem that was home to vast numbers of resident and migratory birds, fish, mammals, and other wildlife. It was this diversity and productivity that made the Laguna a focal element of the Santa Rosa Plain for generations of native Pomo people, and for 19th-century Spanish and American settlers. Today, the Laguna continues to provide vital habitat for a host of native plants and animals, and has been recognized by the Ramsar Convention on Wetlands as a Wetland of International Importance (Ramsar 2017). However, as the population of the area has grown and land use modifications have intensified over the past 150 years, the Laguna has experienced a variety of impacts stemming from urban and agricultural development. These impacts include substantial loss of native wetland and riparian habitats, channelization of streams, alterations to streamflow and sediment dynamics, invasion of non-native species, and water quality impairments. While the Laguna still exhibits elements of its former character, the modern Laguna represents a landscape profoundly altered by over a century and a half of both direct and indirect modifications. 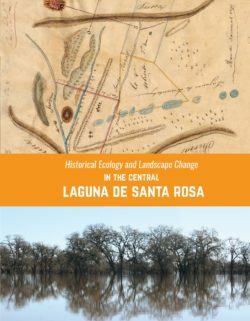 As residents and land managers look to improve the ecological health of the Laguna and restore lost ecological functions, an understanding of what the landscape was like in the recent past, and how it has changed over time, provides a valuable starting place for envisioning its future potential. 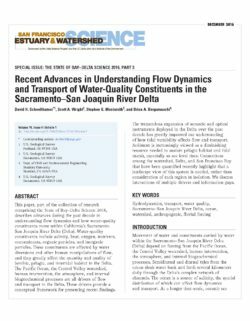 This chapter describes advances during the past decade in understanding flow dynamics and how water-quality constituents, such as salinity, heat, oxygen, nutrients, contaminants, and more, move within California’s Sacramento-San Joaquin River Delta. Water-quality constituents are affected by water diversions and other human manipulations of flow and they greatly affect the quantity and quality of habitats in the Delta. Along with human intervention, the Pacific Ocean, the Central Valley watershed, and the atmosphere, are a few drivers of flow and transport in the Delta. These drivers provide a conceptual framework for presenting recent findings. The tremendous expansion of acoustic and optical instruments utilized in the Delta over the past decade has greatly improved our understanding of how tidal variability affects flow and transport. Sediment is increasingly viewed as a diminishing resource needed to sustain habitat and tidal marsh, especially as sea level rises. Connections between the watershed, Delta, and San Francisco Bay that have been studied recently highlight that a landscape view of this system is needed rather than consideration of each region individually. Interactions of multiple drivers and information gaps are discussed.